Norm Emmets stands along the front row of the mostly empty bleachers near midcourt in The Convo. Sporting a green Ohio sweatshirt and gray sweatpants, he cups his hands over his mouth and shouts at a Cleveland State player, who attempts the first of two free throws. One problem: Norm, a round-bellied 70-year-old, is the only person trying to rattle her. His screams echo amid the drone of the 547 others in the crowd, and he is sick about it. Norm turns to his left, takes a few steps and chats with students in the Ohio band who, when in tune, make the only noise that can drown out his voice. “Convo’s falling asleep here!” he shouts. He is right; The Convo was falling asleep. But in Norm’s eyes, the arena, which seats 13,080, has been asleep much longer than for those few minutes of the Ohio basketball game Dec. 1. The place has been a snooze for nearly five years. That’s because the “O Zone,” a cheering section that used to pack the student side of The Convo, has lost its mojo. The arena isn’t what it once was, back when opponents feared coming into Athens to play the Bobcats. Members of the O Zone who still attend games are mostly indistinguishable from a casual student. Now, Norm wants to help wake up the O Zone. University officials have picked him to revive it, and the reasons they did are simple: His energy and passion are contagious. A day earlier, Norm was spotted Uptown. As students crossed the intersection of East Union and Court Street, Norm, wearing an Ohio sweatshirt and sweatpants, strolled in front of the Alumni Gateway on College Green in the cold to preach his message. The roots for Norm’s passion extend deeper than a love for Ohio sports. Whenever people ask Norm where his energy for the Bobcats originates, he issues them a task. “What I tell them is Google ‘Daniel Lowe,’” Norm says. “Then you'll understand why I act like I do and cheer like I do. It was a cold, gloomy January 2002 day in Athens, but it didn’t matter to Dan Lowe, whom everybody called “D-Lo,” as he waited outside The Convo. He had another four hours before the doors opened for students to enter and reserve seats for the second half of the Ohio basketball season, and he wasn’t taking any chances. D-Lo had to snag his spot: Row 1, Seat 1. It was a few steps away from the midcourt logo, and in his mind, it was his seat to lose. Row 1, Seat 1 is where it all started. 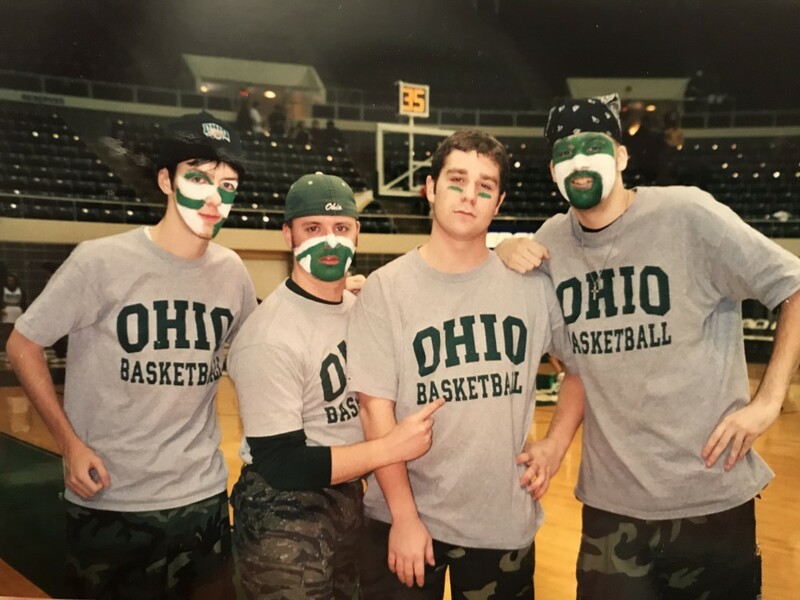 A year earlier, he and about six or seven friends attended nearly all of Ohio’s football games and wanted to continue the fun with basketball. They tried to sit as close as possible to the court and be loud because, well, why not. Everyone in the group bought the same gray Ohio T-shirts and created a small student section. D-Lo was front and center in Row 1, Seat 1. With a thundering yell and 6-foot-9 frame, he stuck out more than any other fan willing to lose their voice and perhaps a little dignity to support a mid-major basketball team. “He stood out because he was loud,” said Rob Metzger, one of Dan’s closest friends. “I was loud, too, but he was, you know ... there was just something where he stood out in a good way." Luke Sayers and Shelley Binegar, marketing employees back then in the Ohio Athletic Department, noticed D-Lo and his friends’ passion and wanted to jumpstart something bigger. If a small group in gray T-shirts can make a scene at every game, why couldn’t more students? “We started brainstorming ideas for a dedicated student section,” Binegar said. “If we're going to do it, let's try to make it a thing. A big thing. Then there was fear. If the efforts, which included reserving a couple of sections for dedicated students and heavily promoting the idea of a raucous student fan base, flopped, it’d be an embarrassment to the athletic department. Not just for the athletic department, but the men’s basketball team, which would be greeting students who showed up to reserve tickets before a random practice in January. “Frankly, we didn't know if we'd have five people show up or 50,” Sayers said. When Sayers and Binegar walked through The Convo parking lot the morning of the event, they couldn’t believe it. They spotted a line of students, hundreds of them, wrapped around the perimeter of the arena. D-Lo was first in line. When the doors opened, he sprinted inside, nearly fell over when the band started its music and grabbed his ticket when he finally reached his spot. Row 1, Seat 1 was officially his, and when the other students followed his lead and dashed inside to snag a seat, anyone’s doubts about the project’s success were pushed aside. The O Zone with its nearly 600 new members was going to be a hit, and it was all because of D-Lo and his energy. He talked to his friends, who talked to their friends, and even went door-to-door in dormitories to drum up support for what became the craziest student section in the Mid-American Conference. With D-Lo at the helm, the energy in the O Zone was infectious. Students continued to flock to the sign-up sheet and then the seats, and the chants from the O Zone, which D-Lo led, only grew louder. D-Lo stepped down from his seat in The Convo and onto the perimeter of court. The hundreds of students behind him, all dressed in white T-shirts, had filled the arena with noise seconds earlier. Now, they’re quiet. Their attention was on the 6-foot-9 man in a do-rag and covered in green-and-white face paint. The men’s basketball team was seconds away from a 78-72 upset over Virginia on a February night in 2003, and as the Bobcats prepared to run out the clock for what would be one of their biggest wins in The Convo, something was stirring in the student section. Dan pointed over to the Ohio bench. Then he pointed to the Virginia bench. The students and their leader pointed and yelled at each side again and again in unison to close out the chant and send The Convo into another frenzy before the final buzzer. The O Zone was at its peak. Those who played in The Convo have compared its student section to ones at Duke, at Gonzaga and at other college basketball powerhouses. No other school in the Mid-American Conference came close to matching its intensity. Walther became one of the few players to experience the O Zone from both sides. “You didn't get tired when you were playing there because you had a couple thousand students screaming at you that you knew you were going to see on Court Street later on that day,” he said. For opponents like Miami, Kent State or Bowling Green, the O Zone was a migraine. Ohio students dug up Facebook or MySpace accounts of opposing players and found the names of ex-girlfriends, hideous pictures or anything else that could distract a player’s concentration from the game. The biggest fan of the O Zone might come as a surprise. Charlie Coles, the winningest men’s basketball coach at Miami, cherished games in The Convo. Coles, who died in 2013, coached the RedHawks from 1992-2012, and admired the rush of playing in front of the raucous student section. Charlie loved the O Zone, and the O Zone loved him. In his second-ever game with the O Zone in 2004, Coles and his RedHawks lost to the Bobcats 67-64. The student section was in full force, and to Coles, that was difference. After the buzzer sounded, he faced the O Zone, dropped to his knees and took a bow. He saluted the student section for its intensity and started a long-lasting mutual friendship with the O Zone. “We would be in the middle of the game and he would be getting into a banter with the O Zone and the student sections,” Dierkers said. “He'd embrace that and engage in that conversation. It didn't help us get the win necessarily, but it made for a great time." Norm Emmets watched from several rows above as his son Jake joined D-Lo and others as they screamed at Coles and other coaches who came into The Convo. Norm was mesmerized at how Dan rallied hundreds of students and made the atmosphere inside the arena rival the best in the country. Norm also saw how important D-Lo was to his son and the Bobcat community. He knew Jake had befriended Dan and other members of Campus Crusade for Christ, but Norm didn’t realize their friendship stretched beyond weekly Bible studies, which Dan hosted, and going to church on Sundays. Jake was a part of something much more exclusive — a group that changed the outlook of a school’s entire fan base. That’s how Norm, a then 26-year high school football coach and University of Findlay graduate from Richfield Park, New Jersey, fell in love with Ohio sports. “It's like, that's where his son went,” Jake said. “I think he just enjoyed going every time. I don't think he has a school of his own that is big going into sports. With the amount of people he's met, with my friends and all those people, I think he just stays a good fan." Even after Jake graduated in 2005, Norm’s admiration for Ohio and the O Zone never waned. His 90-minute drive from his Dublin, Ohio, home to Athens was worth it. The O Zone wasn’t going anywhere, and neither was Norm’s fandom. Then the unthinkable happened. Just weeks after Jake’s graduation, Norm received terrible news. Dan Lowe collapsed during a pickup basketball game June 24, 2005 at The Convo. Doctors pronounced him dead at O’Bleness Memorial Hospital. An autopsy revealed he suffered cardiac arrhythmia, an irregular heartbeat. The news shocked the Ohio community. Friends and family mourned and tried to grasp how something so sudden could happen to a young, energetic and athletic man. Norm was among the hundreds of mourners in attendance for Dan’s funeral six days later in Canal Fulton, Dan’s hometown. As he glanced around the church, Norm saw the same people he and Jake cheered with in Athens, the same friends Norm had hosted in his house when they needed to get away from school, the same group that showed him how to root for Ohio. It’s an emotional scene he still remembers. “We made sure to be up there and be with them,” Norm said. “You could just imagine, those guys being that old and losing your friend. When Norm attends an Ohio basketball game, he always stands in the same spot. It’s the same section of the O Zone where its loudest members stood nearly two decades ago when D-Lo and the others from Campus Crusade built the exclusive club for the rowdiest Ohio fans. There’s one spot where Norm doesn’t stand. Row 1, Seat 1. The spot is commemorated with a small, gold plaque to remember D-Lo, and it’s usually a seat or two away from where Norm can be seen, but mostly heard, anywhere in the arena. Thirteen years after Dan’s death, Norm has always tried to replicate the former O Zone leader’s spirit. It doesn’t matter if there’s a crowd behind him or not, and it never will. The times, however, have changed. The O Zone and its chants aren’t as noticeable. The enthusiasm has evaporated over the last five or six years for various reasons. Games are almost always streamed online, and the O Zone no longer has its own courtside section dedicated to members only. Gone are the days of hundreds of students standing, never sitting, in the pull-out bleachers opposite from the team benches. Any coordinated chants typically come from students in the band. Norm has seen the dwindling numbers in the student section. He wishes it were different. That’s why he was standing alone on a cold afternoon on Court Street begging students to come to the next game. It’s what D-Lo would’ve done, and it’s basically what he did when he stood outside The Convo for hours, desperate for the first O Zone ticket. In the future, however, Norm won’t be alone. The Ohio Athletic Department is launching “D-Lo’s Crew” to inject life back into the O Zone. 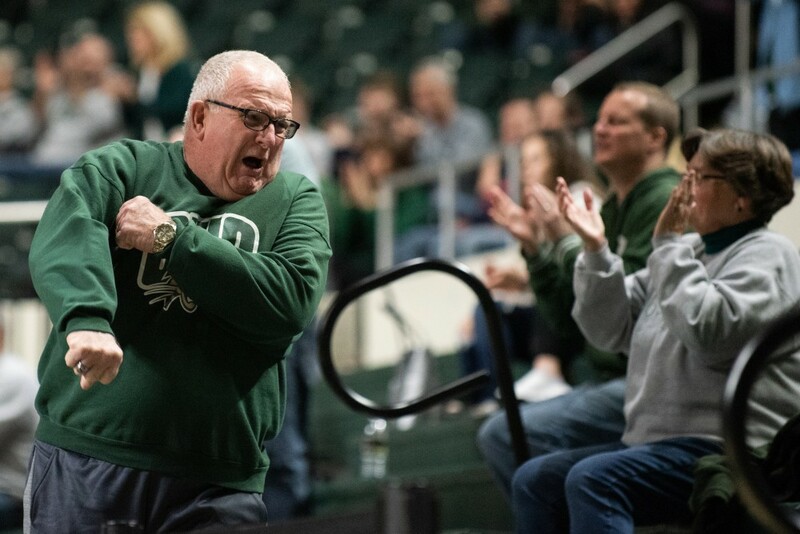 The crew will attend the remainder of home men’s basketball games, with a long-term goal for attendance at all sporting events at The Convo, and bring back the same vintage O Zone chants that echoed inside The Convo for years. Stephens noticed Norm in 2017. He approached him at a basketball game in November to thank him and tell him about an idea he had for a group of students who would recreate the energy of the O Zone. When Stephens and the athletic department named the group “D-Lo’s Crew” in a meeting weeks later, they had no idea that one of their biggest supporters knew everything about Dan and his meaning to Ohio sports. When Stephens told Norm the group’s name, he was shocked. “The fact that it connected so much with Norm was just amazing,” Stephens said. “It was awesome. It was a natural way for him to be a part of this." Norm pinned the date in his mind as soon as he heard it: Jan. 15, the launch date for D-Lo’s Crew. The group will have a maximum of 100 members, a fraction of the size of the O Zone in its prime, but they’ll all wear white T-shirts and stand behind Norm. It’s uncertain how fast D-Lo’s Crew will expand, but that’s of little concern to Norm. His No. 1 goal is being accomplished — Dan’s spirit will be remembered. He plans to stand and yell on Court Street again on Tuesday before the Ohio-Kent State game. This time, he wants to rally support for D-Lo’s Crew. But his goal — to ensure the spirit of D-Lo never leaves The Convo — remains the same.